You may purchase punch cards below for adult drop-in classes. Drop-in passes are good for 6 months from the date of purchase. They can be used for all of our adult drop-In classes. First-time students may purchase 2 weeks of unlimited drop-in classes. Good for ten adult drop-in classes. Expires after 6 months. 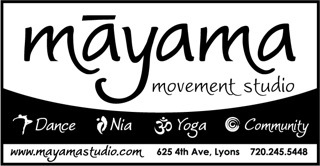 Copyright © 2019 Mayama Movement Studio. All rights reserved.